Former Scotland goalkeeper Alan Rough believes current stopper Allan McGregor could be crucial to the country's chances against Serbia and Macedonia. McGregor was initially a doubt for the opening World Cup qualifiers but was named in the squad. "The quality of goalkeepers like Allan McGregor can win a game for us," said Rough, who won 53 Scotland caps. "When that shot comes in, you've got to be mentally prepared. Allan McGregor has proved he can do that." 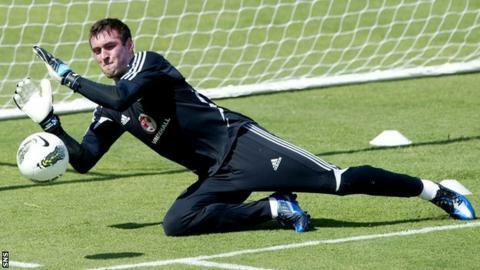 An injury picked up during Scotland's 3-1 friendly win over Australia put Beskitas goalkeeper McGregor's chances of featuring in the qualifying double-header in peril, but the former Rangers player has made a quicker than expected recovery. "Everybody has been talking about the strikers and talking about goals," said Rough. "Me, being a goalkeeper, I think it's all about the goalkeeper. Goalkeepers win games and people seem to forget that. "At most top clubs, if you don't have a top goalkeeper, the goalkeeper who can win you a game, then you're not going to get anywhere. "In the Champions League last year, Petr Cech won the Champions League for Chelsea. "Serbia are going to have something - he's going to have to make a save. "At international level, you've got to have the goalkeeper who can make that save and he's proved that he can make it. These saves win games." One area of the team where coach Craig Levein may be forced to make changes is his defence, with original full-back options Danny Fox, Russell Martin and Charlie Mulgrew pulling out of the squad. However, Christophe Berra has joined up with the squad after the birth of his first child. "Hopefully it's not going to change too much," added Rough. "He's played with Gary Caldwell, he's played with Christophe Berra and he's played with Andy Webster. "It's not like at club level, when a couple of foreign centre-halves come in and the language barrier is there and you don't know their strengths and weaknesses. "They know each other now because they have played together and that can only be a good thing. "If we get two wins, it sends everybody away with a smile on their faces and they are upbeat and we don't have the doom and gloom scenario. "It would be great if we could take six points so we can be positive about the next couple of games rather than be negative."